Will mold grow in my Aprilaire humidifier? In order for microbial growth to occur three conditions must exist: There must be an organic food source for the microbes, the temperature must be in a certain range, and water must be present for an extended period of time. These conditions can exist in some types of humidifiers, but Aprilaire evaporative humidifiers are designed to prevent microbial growth. None of the materials in Aprilaire humidifiers provide a food source. Even the paper Water Panel in Model 400 is treated with an anti-microbial agent. Most significantly however, the drain-through technology in Aprilaire evaporative humidifiers leaves no standing water once the humidifier turns off. All the water delivered to an Aprilaire evaporative humidifier is either evaporated or goes down the drain, leaving all surfaces dry between humidification cycles. What is the warranty for my Aprilaire humidifier? Any Aprilaire humidifier installed after January 1, 2007 carries a 5-year limited warranty on parts from the date of installation, when installed by a licensed HVAC installer. If not, the warranty is void. Prior to January 2007 the warranty was 1 year limited warranty on parts from the from the date of installation, when installed by a licensed HVAC installer. How do I know when my Aprilaire bypass humidifier is operating? If the humidity in your home is 45% or higher your Aprilaire bypass style humidifier will not run. This is because this the highest humidity level our humidifier’s will attempt to attain. If you turn your humidistat from 15% to 45% and the humidifier does not run this is verification the humidity in your home is above 45%. Once the humidity level drops below 45% your Aprilaire bypass style humidifier should operate anytime the furnace is producing heat and the indoor relative humidity is less than the humidification set point on your humidistat. If not, we recommend contacting your installing contractor to troubleshoot the humidifier at your home. What kind of humidifier is the Aprilaire humidifier? Aprilaire humidifiers are an evaporative style humidifier which require heat, water and air movement in order to add moisture to the air. Moisture in the form of vapor is added whenever the humidity level in the home is lower than the desired level and the HVAC system fan is moving air. Aprilaire humidifier’s are designed to maintain a relative humidity level of 35% anytime the outside temperature is 20F or above at an indoor temperature of 70F. If your HVAC heating system has a short run time for a heat call, this will result in a short run time for the humidifier and may result in not reaching the desired humidity set point. Whenever there is a need to add humidity to your home, the humidifier control will send a signal to the humidifier to operate. Water is introduced into the humidifier and flows over the Water PanelÂ® evaporator. The air moving through the HVAC system moves through the Water PanelÂ® evaporator absorbing the moisture into the air. The vapor is then distributed to your home, through the duct work by the blower of the HVAC system. The humidifying process continues until the humidification set point is reached or the HVAC system stops operating. Water not used in the evaporation process is used to flush away mineral deposits left behind from the evaporation process down the drain. The only models where deposits are not flushed down the drain are the models 400 and 400M as they are drain less humidifiers. Most Aprilaire evaporative humidifiers are wired by the HVAC installer to only operate when the heat is operating. If the humidifier is supplied with hot water, the humidifier can be wired to operate on an HVAC fan call. The fan call is initiated by the thermostat which includes a switch to run the HVAC system fan continuously. This fan call can be turned off once the desired humidification level has been reached. What is the proper relative humidity to have in my home during the winter? Aprilaire like any other humidifier manufacturer designs our humidifiers to maintain an indoor relative humidity of 35% at an indoor temperature of 70F, anytime the outdoor temperature is 20F or above. Some homes may be able to attain a higher indoor humidity , however, factors such as the age, cubic footage (square footage times ceiling height) and tightness of the home, as well as the operating time of the HVAC heating system will affect the actual level achieved. Humidifiers require heat, water and air movement in order to add moisture to the air. Moisture in the form of vapor is added whenever the humidity level in the home is lower than the desired level and the HVAC system fan is moving air. If your HVAC system has a short run time for a heat call, this will result in a short run time for the humidifier and may result in not reaching the desired humidity set point. Will an Aprilaire Humidifier cause mold in my home? What causes condensation on my windows and how can I eliminate it? Cold air outside your window cools the air just inside your window more than the air in the rest of the room. If the well-humidified air just inside the window cools too much or too quickly, it can’t hold as much moisture as before and water appears on the window. To eliminate this, follow the suggested settings on your manual humidistat and adjust the setting in the morning for the anticipated night time low temperature. Another option is to upgrade your manual humidistat to an automatic digital humidifier control (model 60), which always maintains proper level of humidity with minimal or no adjustment required by the homeowner. To obtain a model 60 please contact your heating and cooling contractor. Will an Aprilaire humidifier harm my heating and cooling system or air cleaner? Aprilaire humidifiers are an evaporative-style humidifier. Unlike misting or atomizing humidifiers which put water droplets into the air stream, Aprilaire humidifiers use a natural evaporation process to generate humidity. The humidity created is a gas which simply passes through any component in the heating and cooling system or any air cleaner including an Aprilaire air cleaner with no adverse effects. The humidity created by your Aprilaire humidifier is no different than the humidity present in your home during the summer months. Can I purchase an Aprilaire Humidifier at a retail outlet? What will it cost to install an Aprilaire Humidifier in my home? Why does Aprilaire offer an automatic and a manual humidifier control for the Aprilaire humidifiers? 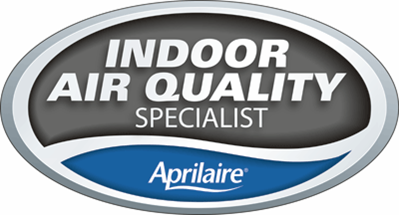 As the #1 manufacturer of humidifiers in the country, Aprilaire feels it is important to offer a humidifier control option for all applications. The automatic digital humidifier control is the top of the line when it comes to technology. An outdoor temperature sensor continuously reports changes in the outdoor temperature to the automatic digital humidifier control located on the cold air return duct. The automatic digital humidifier control uses this information to determine if the home requires additional humidity, to ensure the optimum humidification level is maintained. However, we realize there are some applications where it is impractical or impossible to run an outdoor temperature sensor to the outside. This is why we provide a high quality manual humidifier control for such applications. The automatic digital humidifier control also includes the option of operating in manual mode. Manual operation requires the homeowner to manually adjust the humidity level on the humidifier control as the outdoor temperature changes. Having these options allows flexibility to meet every customer’s humidification needs. Which Aprilaire humidifier should we purchase for our home? There frequently are several different Aprilaire models which will adequately humidify your home. The most qualified person to help you decide which Aprilaire humidifier model will best fit your needs is your local heating and cooling contractor. They can recommend and install the best Aprilaire humidifier for your home based on its size, age and construction. How do I operate the manual humidistat for my Aprilaire humidifier? The Aprilaire manual humidistat is designed to be installed on the cold air return duct or on an interior wall in the living area of the home. To determine the relative humidity in the home, slowly turn the knob on the control clockwise and counterclockwise and listen for 2 clicks. The actual relative humidity in the home is between the 2 clicks. It is important to anticipate a drop in outdoor temperature and reduce the humidity setting in order to avoid excess condensation. The excess condensation occurs because the indoor relative humidity is higher than what the home can support for the current outdoor temperature. To adjust the humidity setting, simply rotate the control knob to the desired setting. Provided the HVAC system fan is operating and the humidification level is lower than the new set point, the manual humidistat will activate the humidifier. How do I turn my Aprilaire humidifier off at the end of the humidifier season? All Aprilaire humidifiers include a control which is either located on the cold air return duct or in the living area of the home. Below are a few of the controls we have offered since our humidifiers were introduced in 1954. The humidifier controls which have an off position should be placed in the off position. If the humidifier control does not have an off position simply turn the dial to the lowest setting and follow the applicable steps below. The summer/winter knob on the HVAC duct work is the bypass damper. Annual summer shutdown for bypass models 400 series, 500 series and 600 series close the bypass damper, which is a part of the humidifier, with the small damper handle. The model 700 series and model 800 steam humidifier simply require the adjustment of the humidifier control where applicable.